For the past almost 5 years that I’ve been writing the blog, my sole financial focus has been to pay off debt. But now that I’m this close *imagine fingers just a pinch apart* to having all of my debt paid off (other than the mortgage), I’m finally starting to accumulate savings and have options for how to make my money work for me. I’ve been building savings steadily every month for the last 5 years. While I still don’t have a full 6 month emergency fund, I’m working on it. So, why am I considering using some of my savings to build a Certificate of Deposit (CD) ladder if I don’t have a fully-funded emergency fund? Before I explain the how and why I’m building a CD ladder, it’s important to know what one is. CDs are a very safe and stable type of investment because they are backed with FDIC insurance from the US Government (or by the NCUA if you’re opening a Money Market Certificate with a credit union). But keep in mind this also means that they are typically a lower-earning investment over the long term. Volatility in an investment usually means bigger gains, but it can also mean bigger losses. In my opinion, a CD is a great first investment if you want to earn more on you money than you can in a savings account, and you don’t really want to “gamble” with your money in another type of investment where you could lose it all. One of the biggest drawbacks of investing money in CDs is that your money is pretty inaccessible during the CD’s term. For example, if you buy a 5 year CD, you can’t access the money you’ve invested until the CD matures at the end of the 5 year term. Unless you decide to withdraw early and pay fees and penalties which could eat into the amount of interest your investment earns. This is where building a CD ladder comes into play. A CD ladder is a series of CDs with varying maturity dates, just like the rungs on an actual ladder. 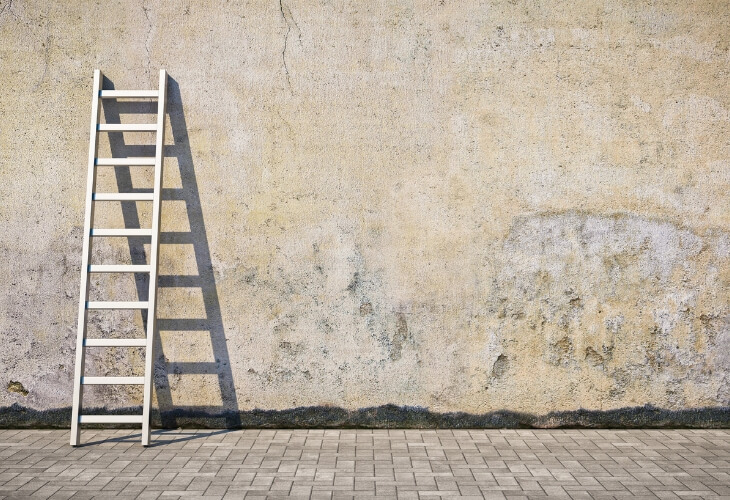 What are the benefits and drawbacks of a CD Ladder? There are several benefits and drawbacks to building a CD ladder. In the example above, you would have access to your money each year when one of the CDs matures. At that point, you can either buy another 5 year CD (because the 5 year CD you previously bought will have 4 years left at this point), or put your money back into savings or another type of investment. Another not-so-obvious benefit of building a CD ladder is that it helps you avoid spending your savings. Of course you build savings for various reasons, like an emergency fund, a travel fund, a new house fund, etc. The point of some of those savings is, in fact, to spend them at some point. However, in the interim you may encounter situations that tempt you to spend your money on something other than its intended purpose. For example, I was tempted recently to spend some of my savings on a snow removing robot because of how much I hate winter. (NOT an affiliate link! 😉) Alas, I’m not saving for a snow removing robot, so I didn’t buy one. If my money was invested in a series of CDs, I would have less access to spend it when these types of temptations arrive. I could also time the CDs so they mature at or around the time I will actually need, or want, to spend the money for its intended purpose. Note: With your emergency fund, your goal is to never touch your money unless it’s emergency. I do NOT recommend investing your emergency fund in any type of investment as it’s supposed to be liquid savings you can easily access in an emergency! CDs and a CD ladder isn’t the investment that will earn you the absolute most interest. You can probably earn more interest by investing your money all into one longer-term CD than by buying multiple CD’s when you first start your ladder. But, when each CD in your ladder matures and you re-invest your money into a new 5 year CD, you’ll be able to take advantage of the rates that are often higher for longer-term CDs. Just know you’ll miss out on a bit of this when you are initially building your ladder. That said, there are definitely other types of investments that can yield higher return than CDs. But as mentioned earlier, CDs are a very secure investment and some of the other investments that may yield a higher return are also more volatile. Thus, you may also end up losing money in those investments instead of gaining the higher return you were after. If 5 years seems like a long time to invest in something, you could opt to build a mini CD ladder instead. A mini ladder works the same as a normal CD ladder but on a shorter time frame. Instead of buying CDs that mature each year for 5 years, you can build a ladder with CDs that mature every 3 or 6 months. This way you have even more liquidity with your investment. However, you may be giving up some of the potential higher earnings from having longer term CDs. For me, CDs feel like a good, safe investment choice to earn a higher return as I get to the point in my own financial journey where I have money set aside in savings. I do use a high-yield savings account for all of my savings, but CDs can help me earn a little more interest with the same money I’ve already set aside. For the purposes of cash flow/liquidity, I’m going to build a CD ladder rather than putting all of my money into one CD. It may also help me take advantage of (hopefully) rising interest rates over time as I have the chance to buy a new CD each year when one from the ladder matures. When I get ready to build my CD ladder, likely in a month or two, I’m going to shop around to find an institution with competitive rates and terms. It’s important to look beyond just the interest rate when choosing where to build your CD ladder. You should also look at the rules and penalties for early withdrawal, as well as other terms on the account. Also, some banks and credit unions will offer lower minimums for CDs. For example, you may be able to start each CD with only $500 instead of $1,000. Others may have higher initial investment requirements in order to qualify for a higher interest rate. I’ve also heard that considering the integrity of the financial institution is important as some may try to sell you other products that may or may not be as financially beneficial for your once your CDs start maturing and you have cash in hand. All that said, one financial institution I’m considering is PenFed Credit Union because they have competitive rates and terms on their Money Market CDs, plus their dividends (earnings on the investment) compound daily, which helps you earn more on your investment. Wherever I decide to build my CD ladder is likely where I’ll buy each of the CDs rather than buying from multiple institutions. Although you may be able to earn more interest and take advantage of special rates by buying CDs at multiple institutions, I personally prefer to keep things simple whenever possible. Having all of the CD ladder rungs at the same institution would help keep my finances simplified. Have you ever built a CD ladder? If so, do you have any tips for me? If not, would you consider building one? This post is in collaboration with PenFed Credit Union. The views expressed in the article are the views of the author and do not necessarily reflect the views of PenFed Credit Union. PenFed Credit Union is an Equal Housing Lender and is federally insured by the NCUA. I actually did this when I was in school from 1990 (when interest rates were around 8%!!) to 1992 (when the rates dropped to about 3.5%). I would get funds from a student loan or a grant and deposit it into a 3/6/9/12-month CD so that when it came time for tuition, I could pay it with the maturing CDs. Too bad I didn’t retain that “investment mode”, not jumping back into said mode until 10 years later. But the CD ladder was very helpful to me as a student. Kudos to you for investing again – here’s hoping interest rates get more reasonable…some day! You were super smart! I never even thought about this as a college student. And yes, hopefully someday!